The Meridian First Light House, proudly taken to America to win a podium finish in a global competition, began life within Victoria University’s School of Architecture and Design, when a small student group gained entry into the prestigious US Department of Energy’s Solar Decathlon. 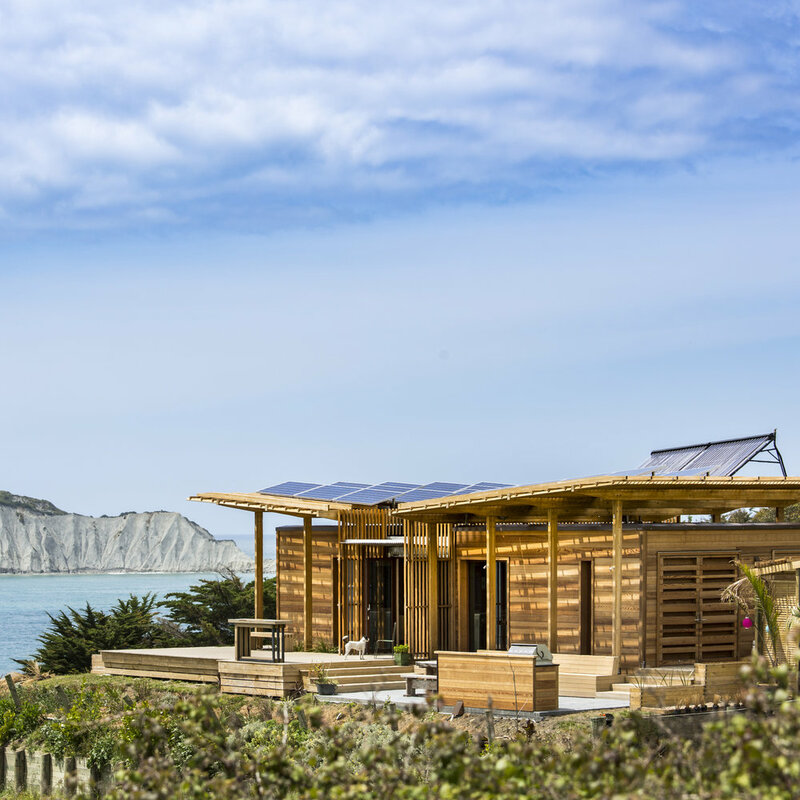 With a keen focus on research and design, the team set out to take on the world - to show that a New Zealand beach house could perform way better than the country’s existing building stock. We started as four architectural students with an undergraduate design project in 2009. On acceptance into the Solar Decathlon competition in early 2010, our humble paper scheme became a fully-fledged, full-scale solar-powered eco house. We were the first entrants from the Southern Hemisphere to ever win a place in the international competition. Hailing from the first country in the world to see the sun every day, First Light was born. A buzzing office grew out of VUW’s Architecture and Design faculty, to accommodate the growing project and the growing team. Comprised of students from various schools and campuses around Victoria University, we set out to design a net-zero energy home that could compete with the best in the world at the competition. A design competition like no other. The Solar Decathlon is a biennial event run by the U.S. Department of Energy, which takes place in the USA; formerly in Washington, DC, and now in Orange County, California. It challenges 20 University teams from around the world to design and build solar-powered houses; to transport their houses to the competition site, and to compete in ten contests across a ten-day public exhibit. The winner of the competition is the team that best blends affordability, consumer appeal, and design excellence with optimal energy production and maximum efficiency. (U.S. Department of Energy, 2012). The ten contests are designed to reflect the many aspects that make up a successful home. They are each evenly weighted, assessing energy efficiency, liveability, buildability, affordability, and the level of public and industry outreach that each team can generate. 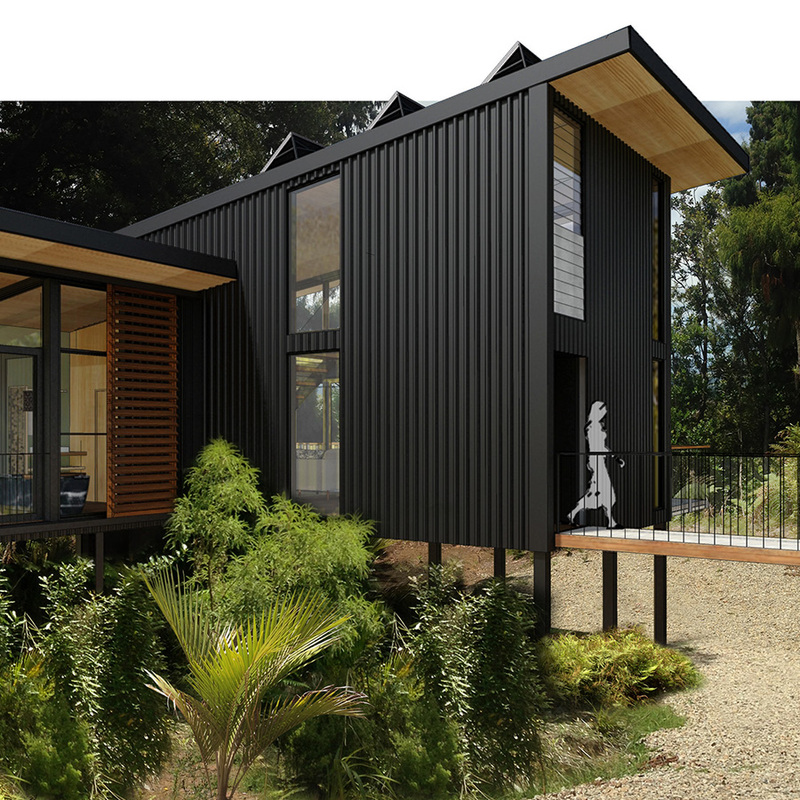 For the competition our design concept was based on the classic kiwi bach – a New Zealand holiday home - where New Zealanders retreat to ‘get away from it all’ and to get back to basics. In terms of New Zealand building typologies, the bach best exemplifies our Kiwi values, with its strong connection to the landscape, evidence of a hands-on ‘do it yourself’ mentality and its encouragement of socialising and spending time outdoors. With these values as our starting point we developed a compact one-bedroom, 70m² home. With socialising and entertaining at its heart, the house is flexible and functional: able to be transformed to suit both the owner and the natural environmental conditions. Through the centre of the house, the kitchen and dining space easily entertains both small and large groups. At both ends of this space, large bi-fold doors open to extend the living space outdoors, providing for a continuous flow between inside and out. At one end of the house is the the living space, light-filled yet snug. A custom designed built-in furniture unit functions as a seating area during general use, but transforms to accommodate up to four overnight guests. At the other end of the plan the main bedroom, open to the rest of the interior, is visually separated by a study-and-storage furniture piece, strategically placed to act as a room divider. The back edge of the bach houses the services spaces including kitchen, bathroom and laundry, neatly tucked away to make the most of every inch of space. The First Light House was constructed in a Lyall Bay warehouse over the kiwi summer of 2010/11. In April the house was transported in parts to Frank Kitts Park on the Wellington Waterfront, where it was reassembled by the student team and made ready to welcome the New Zealand public. During its two week Wellington showcase, the house accommodated more than 20,000 visitors eager to check out its innovative and eye catching design. In July the house was disassembled, packed into containers and shipped to Washington DC for the competition. On arrival in the USA, the house was met by the now US-based NZ student team and re-assembled in a record six and a half days on Washington DC’s National Mall. Once complete, the little bach was pitted against the other 18 teams in the competition; enduring a gruelling ten-day testing and monitoring period under the watchful eyes of the visiting public. By the end of the competition it had placed first in Engineering, first equal in both Hot Water and Energy Balance, second in Architecture, third in Market Appeal and, most importantly, third overall in the Solar Decathlon. An amazing achievement by a small team from a small country 8750 miles away! After its OE, the house returned to New Zealand and settled into a stunning site above the sea in Waimarama, Hawkes Bay - a well-earned break for a most well-travelled house! 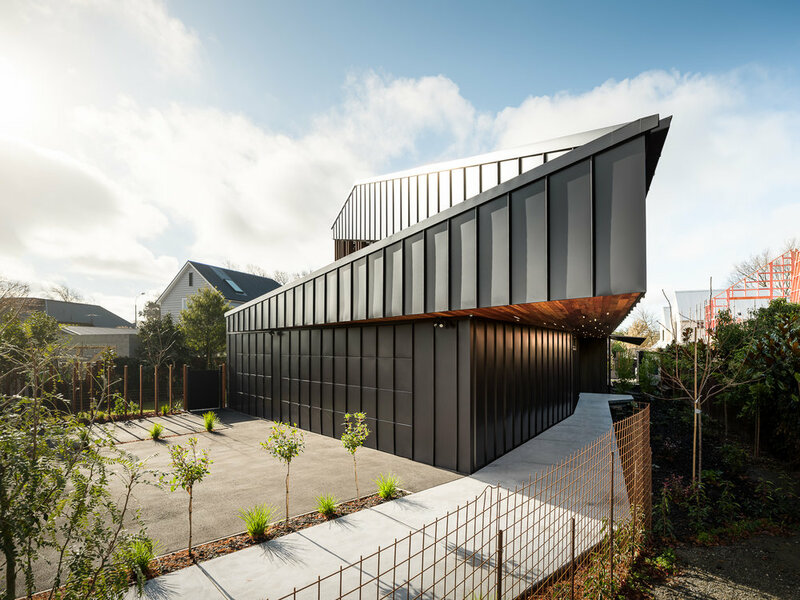 The bach has since scooped additional awards in New Zealand – including commendations in Sustainability, Clever Wood Solutions and Residential Architectural Excellence in 2011’s Timber Design Awards and an NZIA Award for international Architecture. Watch the TEDx talk below to find out more information about the story of the First Light House. Jury's comment: Designed to meet the exacting performance standards of an international student competition in which it was highly placed, Victoria University’s First Light House was a totally engaging project. The Victoria University students made a very impressive attempt to reconcile a typological narrative and mandated sustainable features with architecture. Given the variety of criteria that had to be satisfied, it is understandable that the building, in a design sense, struggled to transcend the sum of its parts. However, it is a significant achievement for a New Zealand design team, of whatever vintage, to produce a building for public show on The Mall in Washington, DC, and the authors of the First Light House are to be thoroughly commended.